NE DAY PAUL said to Barnabas, "Let us go again to visit the brethren in the Gentile countries." Barnabas was willing, so they arranged to start at once. Now, John Mark, the nephew of Barnabas, had come to Antioch again and wished to go with them on their second journey. 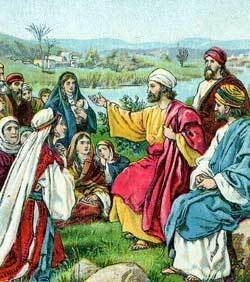 He had started with them on their first journey but had turned back; so Paul did not care to take him this time. Barnabas, however, thought it would be well to take the young man, even though he had turned back the first time. So he took Mark for his companion and Paul chose Silas, the preacher from Jerusalem, to go with him. Finally they came to Troas, a city that was built on the seacoast where ships came from countries even farther away from Jerusalem. Those countries had never been visited by one who knew the gospel. One night while the missionaries were in Troas, Paul had a vision. He saw in his dream a man standing on the shore of the country across the water from Troas and calling. He was looking earnestly at Paul, and crying, "Come over to my country, and help us!" Now another disciple, a doctor named Luke, joined Paul's company, and sailed with him to Macedonia. This Luke afterwards wrote the "Gospel According to Luke," and also the "Acts of the Apostles," both of which are found in the New Testament.